AHOY AND AMEN - PIRATE BBQ AND ELZO EXHIBITION IN HOSSEGOR! 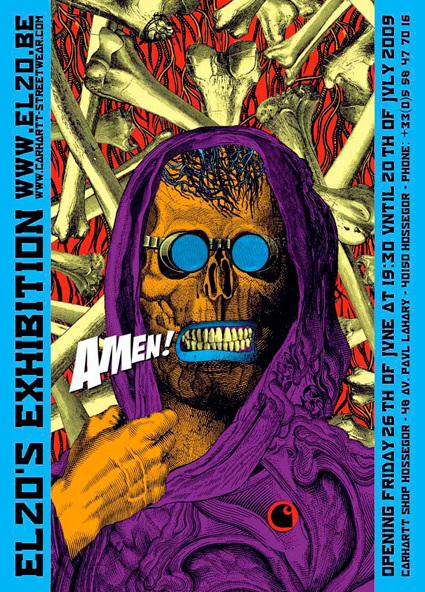 Elzo Durt will give the starting shot on the 26th of June with the Vernissage of his exhibition “Amen” at the gallery space of the new carhartt store in Hossegor. The exhibition will stay in Hossegor for one month and then move on to other cities in Europe (details about the exhibition tour soon). On the 27th you can witness the skills of around 30 Pros from all over Europe erupting at the “Pirate Bowl Boat Quake” taking place at the factory store in Hossegor on the 27th of June. The party will start at 13h and shake the earth with live music, food and drinks until the sun sets and it is time to move on to the afterparty at “Chez Monette” in Seignosse. On sunday the 28th the pirate boat will be open for anyone for a session. Elzo Durt is the artist behind the “Yama & Carhartt Mental Weirdo Asylum Series”, a collaboration series of 4 pro-models between Yama Skateboards and carhartt that are just about to be released.